Art and his mate Guin have successfully raised 2 chicks this year. Both are now flying and doing very well. Art and Guin have had a typically-uneventful incubation and should be close to hatching another brood of youngsters. Our old friend Art was back at his nest by 8:30 am on April 1st (probably arrived back on March 31). I could clearly see the leg band on his left leg as he sat on his favorite perch across the river from the nest. Later in the day I got reports that a female was at the nest too and Art was seen displaying and mating with the female as well as bringing sticks to the nest. I assume that this is his regular mate (Guin), but I’ll need to confirm that when I see her and check for her leg band. Great to see these old friends back once again. Artoo's dad, Art, made a spectacular return to his nest yesterday evening. 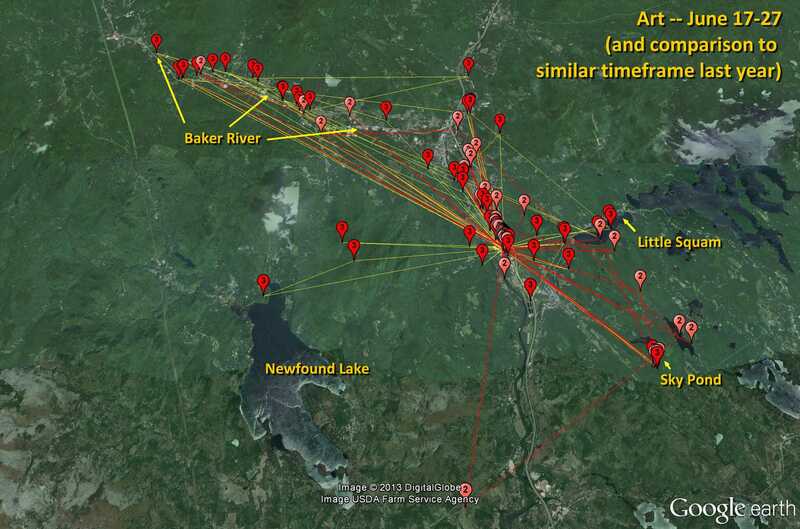 Art wore Artoo's transmitter from May 2012 to August 2013 which allowed us to witness his fall migration route, his winter home, his spring migration route and two breeding seasons of foraging data. Even though he has not carried a transmitter since 2013 we can recognize him by the silver band on his left leg. (his mate -- Artoo's mum -- Guin has a silver band on her right leg). She arrived back at their Bridgewater nest on Thursday, but Art did not arrive home until about 6:10pm yesterday (April 7). On Sunday afternoon another male arrived on the scene and Guin chased him away. On Tuesday morning Guin was on the nest but "tchooping" (a special call that Ospreys only use when alarming at other unwelcome Ospreys) suggesting that the interloper male was still around. At 5:30pm yesterday that male was standing on the nest and Guin was nowhere to be seen. He flew off up river and shortly after, Guin flew up river and landed on the nest. A shrill call was echoing around the river valley. High overhead a male Osprey was performing a spectacular aerial display, known as a "skydance." It was Art. After ten minutes of really amazing loop-de-loop display, he dove down to land next to a clearly happy Guin, who chirped excitedly on the nest. Art's silver band was clear to see confirming that he had safely returned from his 9,000+ mile round-trip to the Rio Tocantins in Brazil. The photos show some of his aerial maneuvers and then perched next to Guin, back turned, head down and wings drooped in a characteristic submissive pose that males adopt when first greeting his mate (after a six months of separate vacations) or during early courtship with a new mate. Welcome back Art. 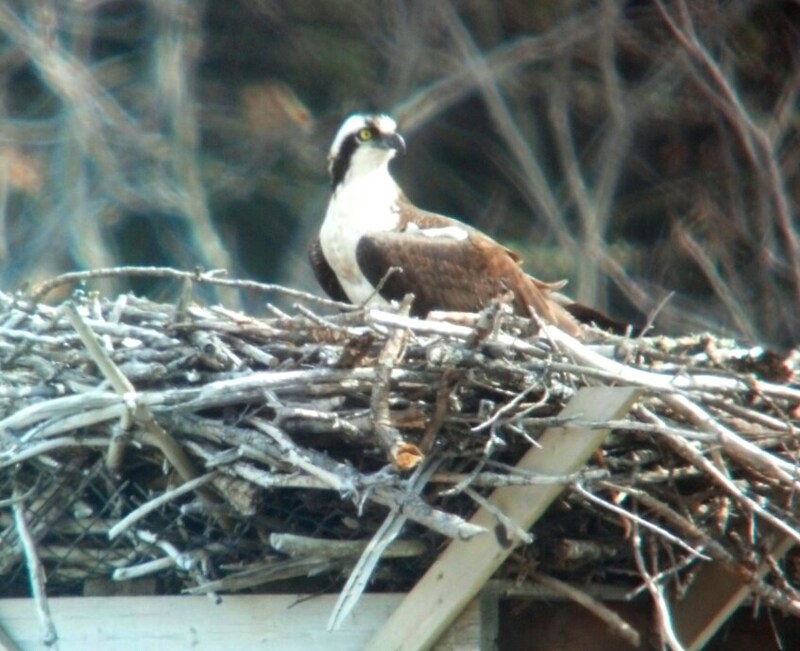 Our old friend Art returned to his nest in Bridgewater on April 7. His faithful mate arrived the same day. They immediately got down to nest repairs and refurbishment. Although Art doesn’t have a transmitter any more, I can recognize him because of the band on his left leg. Also his early return date and behavior confirms it’s him. We know that he would have spent the winter down on the Rio Tocantins and Rio Araguaia in east-central Brazil, so he’s logged over 10,000 miles since I last saw him in September. This will be the last blog entry for this very special Osprey named Art. I had one transmitter left over after our day’s tagging in Hampton Harbor, so Rob and I decided to try to catch one of Art’s chicks. We also agreed that IF we caught Art again, that we would remove his transmitter and reuse it on another bird (perhaps a second chick at Art’s nest). Art has given us all the data we could ask from him. 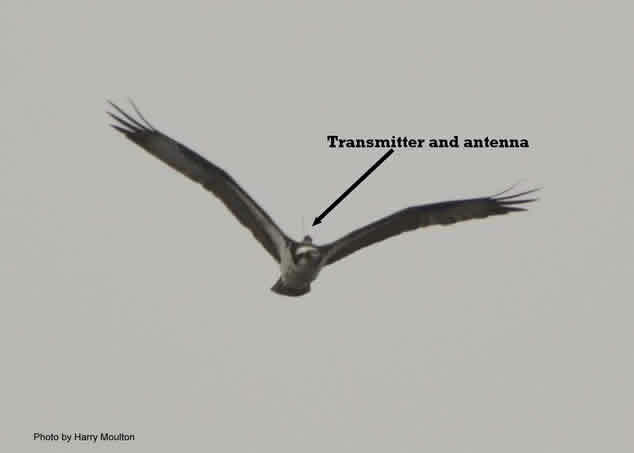 We know all of his fishing spots in his summer territory, we know where he spends his winter (Rob’s work shows that adult Ospreys return to the same winter territory), we know his route south and we know his route north. We’ve watched him raise a chick last year and three this year. So … there was no scientific reason for Art to carry that transmitter south again. We set the trap at 8:05 am and as luck would have it, caught Art and two of his chicks all at once by 8:25 am (amazing). We removed Art’s transmitter, weighed him, checked his physical condition and released him. I will be able to continue to recognize him by his leg band in future years. This is the first time that Rob has successfully re-trapped one of his birds and removed a transmitter. Art has been a star and has become a local celebrity. Many people have watched him around the nest, and seen him fishing in the area. Newspapers and TV stations have reported on his migration journeys. He has proved to be an exceptional Osprey with a secure nest, a faithful mate and an ability to raise healthy chicks. Hopefully he will continue to return to Bridgewater for many years to come. I for one will be waiting for him every April. All of Art’s chicks are now flying. They continue to visit the nest for breakfast, lunch and dinner (and any other snacks they get in between), so Art’s work is not done yet. Mum will be leaving in the next couple of weeks and heading off for her winter vacation. Art will be around for another six weeks of so (if last fall is any guide) before he departs. The map shows all of Art’s points this summer and all of Donovan’s. 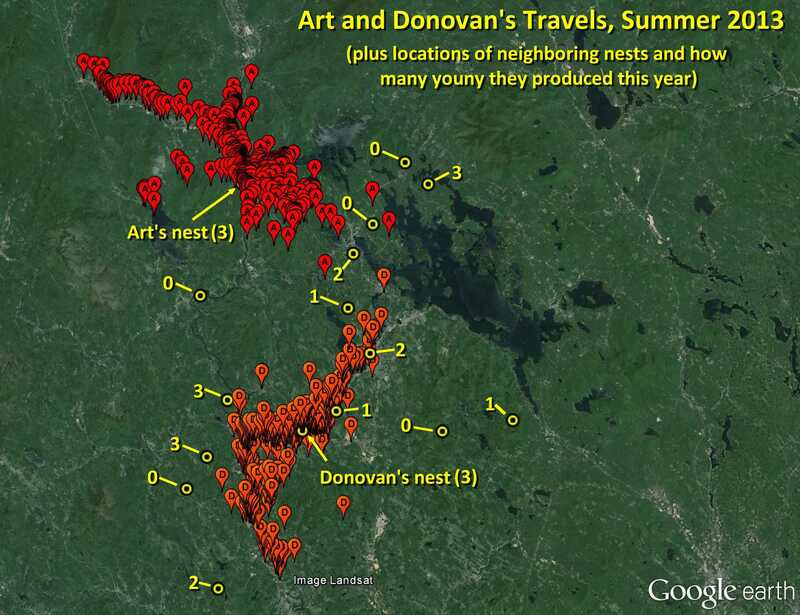 I also added locations of all the other Osprey nests I monitor in the Lakes Region and how many chicks they produced. It was a very productive year for Ospreys in this area. Art managed to not cross the airspace over any of his neighbors, but Donovan occasionally commutes past his nearest neighbors in Belmont and Laconia when he fishes on Lake Winnisquam and up to Opechee. Art and Donovan apparently didn’t meet up all summer. All is well at Art’s nest. The 3 chicks are almost fully feathered and all look fat and healthy. I saw Art perched on the river on Sunday when I stopped by and the chicks were being fed by mom – all lined up in an orderly fashion, getting their share. The map shows Arts travels in the last 10 days. Nothing out of the ordinary. As expected, he is mostly fishing on the Baker River, near Livermore Falls on the Pemi, and on Little Squam, with just one visit to Sky Pond (the water temperature is likely high and the trout deep) and one brief visit to Waukewan on July 5. Art is showing that he is an excellent provider and he and his equally competent mate are rearing three strong and healthy chicks (in spite of the rainy weather). 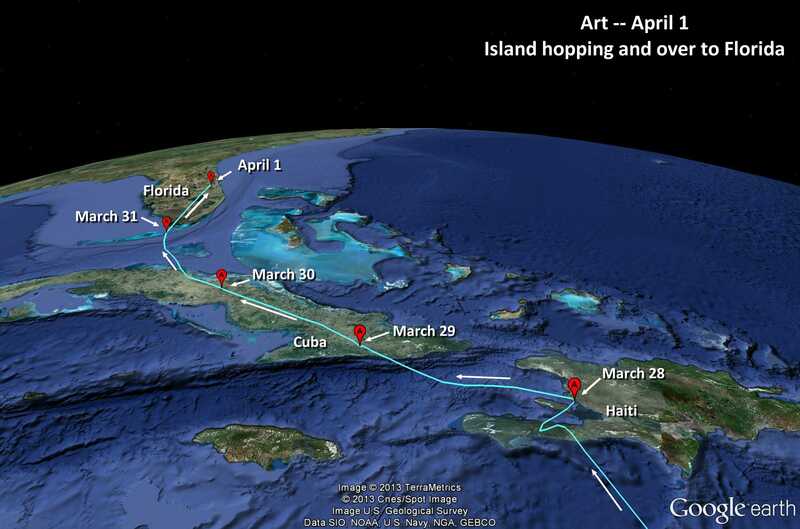 Art’s map shows his fishing locations for the last couple weeks (red 3) compared to the same period last June (pink 2). As you can see, Art is a creature of habit. Right now the Baker River is his favored spot, with his usual trips to Sky Pond thrown in. Iain is in Scotland leading a Nature Tour for the Science Center (and visiting some old Osprey friends in Scotland), so there won’t be an update until he returns on June 28. By then all the chicks should be well grown and Iain will have lots of exciting new data and maps to add to the pages. I was able to count little heads over the weekend and am delighted to report that Art and his mate have three chicks. All were getting a good feed on a big shiner that Art had just brought it. Art is now fishing almost daily on the Baker River – I’m sure it’s no coincidence that the Baker River has been stocked with trout in the last couple weeks. Also for the first time this year, Art visited Newfound Lake on May 30; specifically Hebron Marsh on the west shore. Whatever he found must have been good, as he was quickly back to the nest (no doubt with a fish). He was there and back again quickly on May 31, June 1 and June 2 – a sure sign of a quick catch. We love to see “out and back” fishing trips rather than prolonged, multiple-point excursions. It shows that Art is a very competent fisherman who is able to feed his growing family with minimal effort. The map below shows his fishing trips for the four day period, May 30-June 2. May 30. He started the day on the Baker River at 8am. He was on his way back to the nest at 9am and on the nest at 10am. At 1pm he was over on Newfound Lake and back at the nest at 2pm, then left for his third trip of the day to Little Squam at 5pm. He obviously had no luck there and was back on the Baker River at 6pm. On May 31, he again started the day on the Baker River at 8am and was back at the nest by 9am. 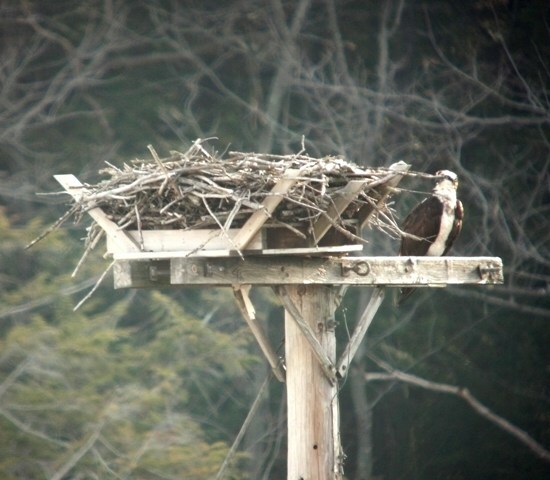 At 11am he was on his way over to Newfound Lake and was back at the nest by noon. At 1pm he was perched on the cell tower next to the Ashland Sewage Treatment Plant. Three points are missing from that afternoon, so I don’t know if he went out a third time, but I suspect he did. 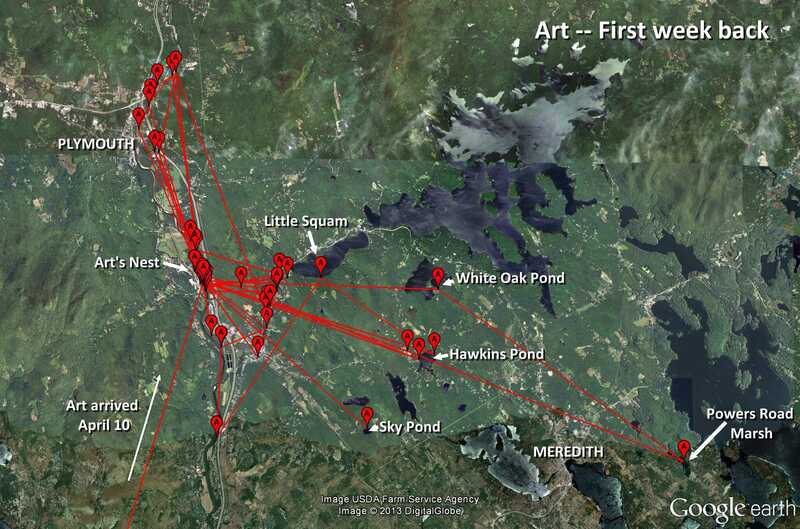 On June 1, he was on his way over to Newfound again at 9am and was on his way back (and close to the nest) at 10am. There is another three-hour gap in data that day too (strange!) and at 5pm he was well to the north and likely on his way back from a trip up river. 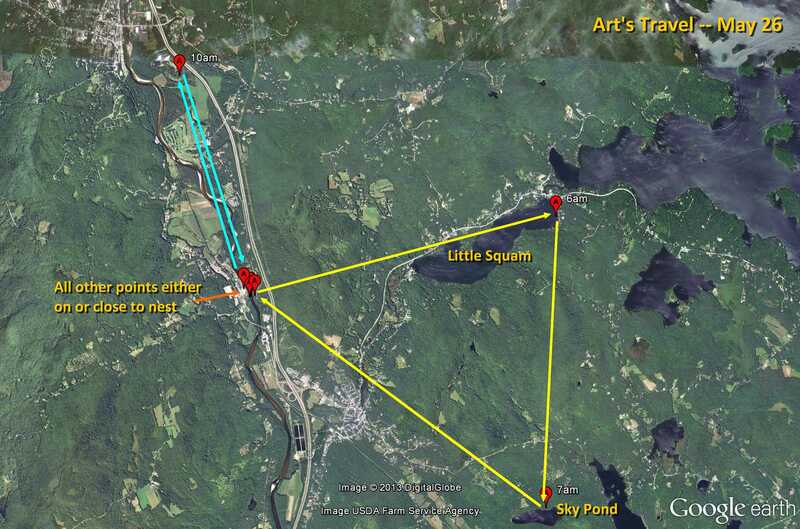 On June 2, he started the day up near Livermore Falls and worked his way up and down the river to the north of the nest before returning to the nest at 11am. 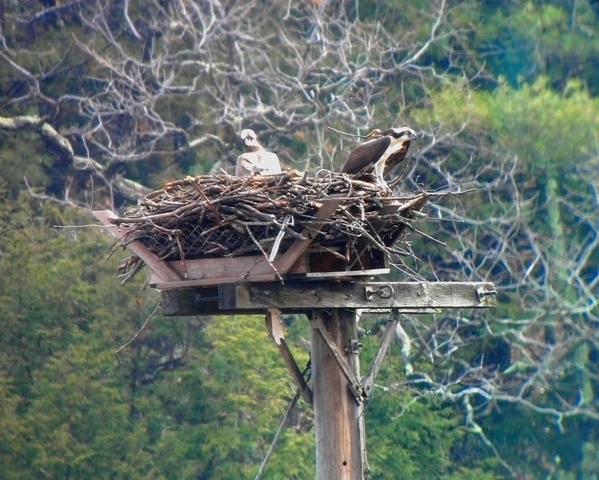 The by 2pm he was back over to Newfound Lake and back to the nest at 3pm. At 5pm he was over near Sky Pond, but by 6pm he was over to Little Squam. Break out the stogies! Art is a dad! On Monday morning, Art’s mate was offering morsels of fish to an as-yet-unseen chick in the nest. Later in the day, her behavior suggested that another egg was hatching. Art was on the nest checking out his newly-hatched family with great curiosity. This hatch is right on time; about 36-37 days after the first egg was laid. I won’t be able to count heads until the chicks are a week old (the nest is so large and deep). Art will now step up his fishing efforts even more. He’s hitting Sky Pond almost daily and up the river towards Plymouth. 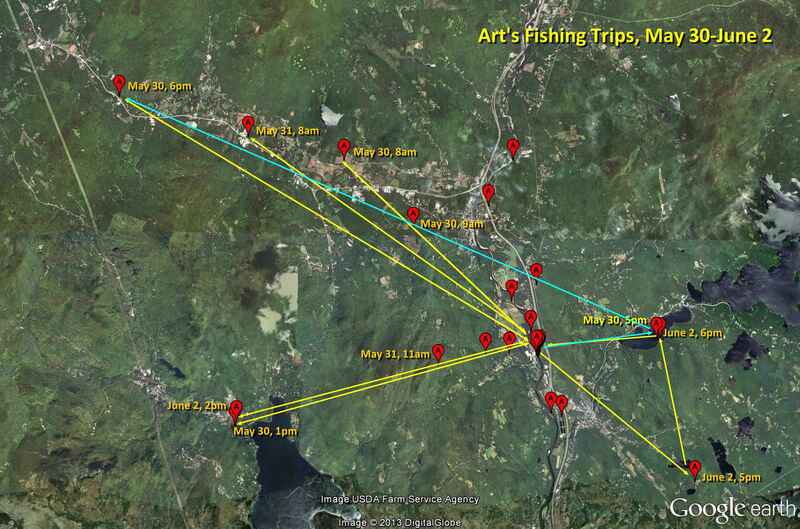 The map shows his travels on one day (May 26) with two fishing trips. Art and his mate are about a week away from when their first eggs should start hatching. Art continues to be an attentive mate and his data suggests that (like last year) he is an accomplished fisherman. Many of his trips are “out and back” to fishing spots, suggesting he catches a fish and is quickly back to the nest. Sky Pond is now a regular fishing location along with Hawkin’s Pond, an occasional trip to Little Squam and lots of trips up river, including his first visit to the Baker River this year (an early morning favorite last June). Last week we successfully caught and tagged two more male Ospreys – see Donovan and Mackenzie - so Art will have to share the limelight!! Nothing much new to report for Art. He and his mate are busy incubating eggs in their nest. 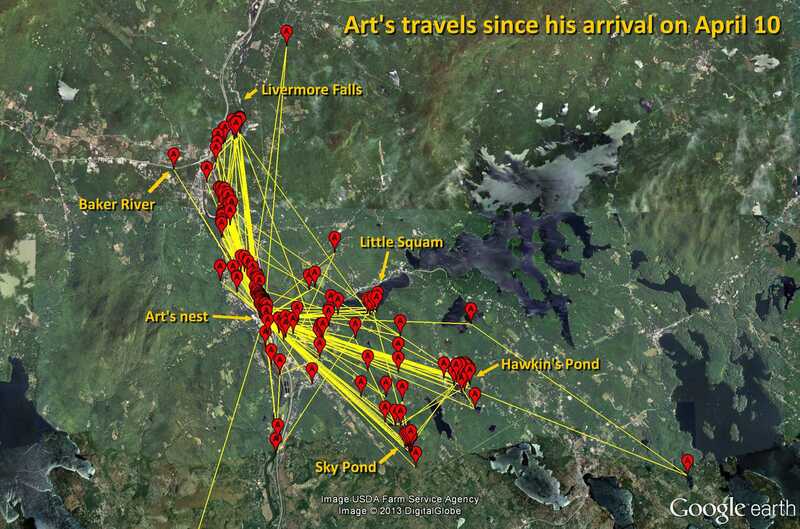 Art’s foraging data shows that he is still favoring the river and Hawkins Pond with an occasional trip to Little Squam. The water must be too cold for trout rising in Sky Pond (a favorite of his last year) but I’m sure that will change soon. The really interesting data is coming from Snowy and Belle. Click on the link above to see the interactive Movebank map. Belle (born in 2009) is the light blue line. She is making her second northbound migration and made it back to Martha’s Vineyard and the Cape over the weekend and is frequenting the same haunts she used last year. Snowy (in green) is making his very first return flight and almost completely missed Florida and made an unnecessarily-long water crossing from Cuba to near Tallahassee, but he has regrouped and is now following a similar inland route that Art took. Where will he end up? He should return to Nantucket, but these first timers often wander great distances before settling somewhere. 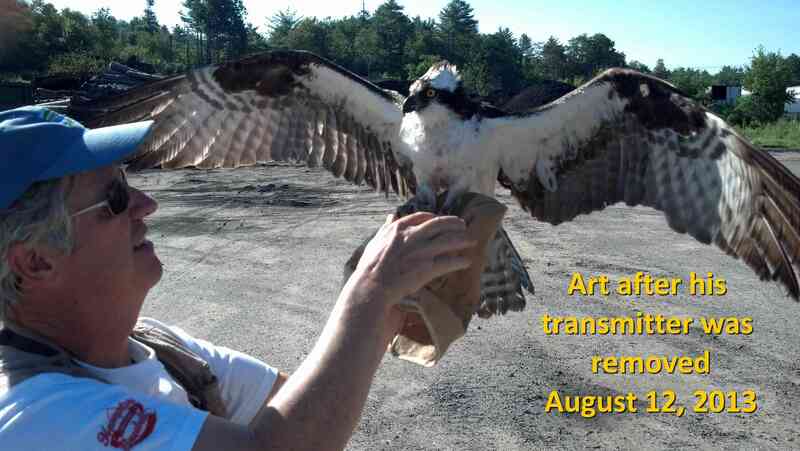 I have four more transmitters to use here in New Hampshire in 2013, so stay tuned for updates on new birds soon. Art and his mate are already sitting on eggs. When I checked the nest on Sunday morning, Art’s mate was sitting low in the nest indicating that at least one egg had been laid. When I stopped by on Sunday, Art was taking his turn incubating. Ospreys lay an egg every two days until the clutch is complete (likely three eggs). Now it’s 35-40 days of incubation until the first egg hatches. The female will do most of the incubation while Art hunts for fish. Most males will incubate the eggs for maybe a quarter of the daylight hours, while the female feeds or preens nearby. The photo below shows Art incubating on Sunday. If you look carefully you’ll see his head peeking through the branches and his transmitter antenna sticking up behind. The nest is nice and deep, so they are well protected from the elements. 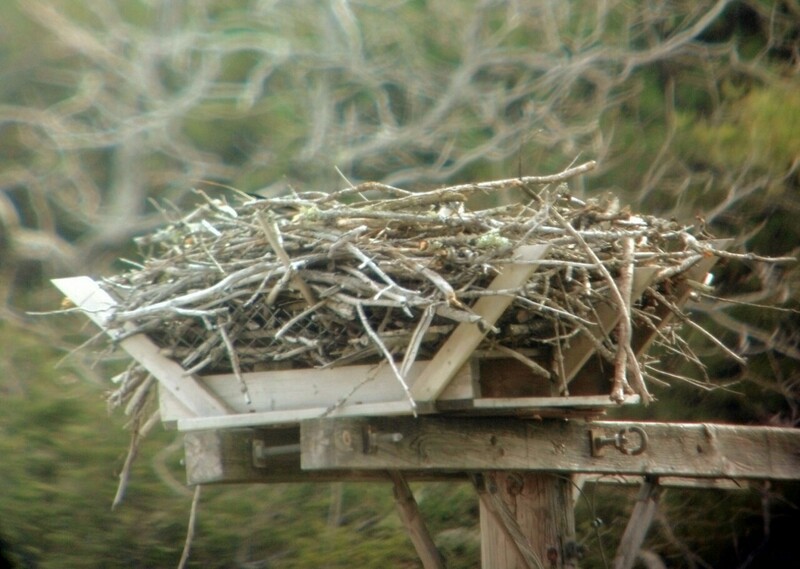 I installed this platform and rebuilt their nest after it was blown out in a storm in 2011. Art’s mate added quite a lot of new branches while she waited for Art’s return. An advantage to a human-made nest like this is that it holds up well to winter storms and the pair has very little repairs to do when they return each spring – they can quickly get down to breeding. Nothing new on Art until next week, but Rob has updated the maps for Belle – one of the juveniles we are following. It’s a great demonstration of how young Ospreys learn the safest route home – a route that almost all adult Ospreys use. 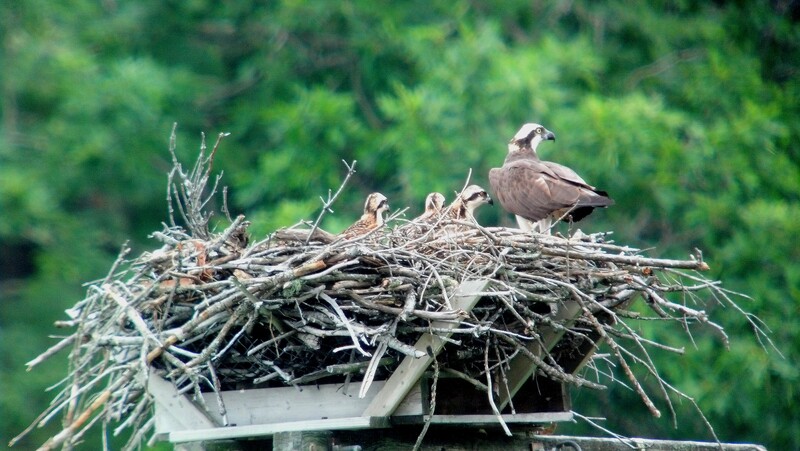 Also, the Estonia Osprey webcam (my favorite) is up and running and has new URL. Now that Art’s migration is over, I’ll try to do a quick update each week. He and his mate are settling in and should be sitting on eggs within the next 10 days. Art is visiting many of the same favorite fishing haunts that he used last summer, although some have only now just cleared of ice. He made an interesting trip on Sunday to a location that I never saw him use last year – a marsh over on Powers Road on Meredith Neck, almost 11.5 miles from his nest. He didn’t catch anything, as an hour later he was fishing on White Oak Pond (another water body that he didn’t use last summer). He was successful there, as he returned to the nest area by 4 p.m. At 4:11 on Sunday I was at the nest and saw him perched across the river from the nest with a large, still twitching, Pickerel (so now I know where he caught that). On his first night back at the nest (April 10) he roosted more than 3 miles downriver from the nest, at a roost he used in September right before he migrated. Since then his last point each night has been very close to the nest, so I assume he is roosting there. I’m keeping a close eye on the progress of Belle and Snowy – two of Rob Bierregaard’s other tagged birds. Belle was hatched on Martha’s Vineyard in 2010 and is returning to New England for the second time, having wintered in Brazil. Snowy was hatched on Nantucket in 2011 and is returning for the very first time having spent the last two winters in Venezuela. The number of our tagged juvenile Ospreys that have made it to this stage is very few, so we are very interested to see where they go and whether they are able to find an opening at an existing territory or establish their own nest. Belle did not breed last year, but spent most of the summer on the Vineyard with an occasional trip over to the Cape. Belle was in Florida yesterday having safely navigating the Caribbean. Snowy has stalled out in Cuba where he has been feeding in a coastal marsh on the north side of the island. Hopefully he’ll get going again soon. You can check out their progress on the interactive Google Earth map on the Maps page. An amazing follow up to Art’s story. While we were patiently waiting for Art’s arrival at his nest in Bridgewater, it turns out that Art was doing a little socializing at the neighbors. 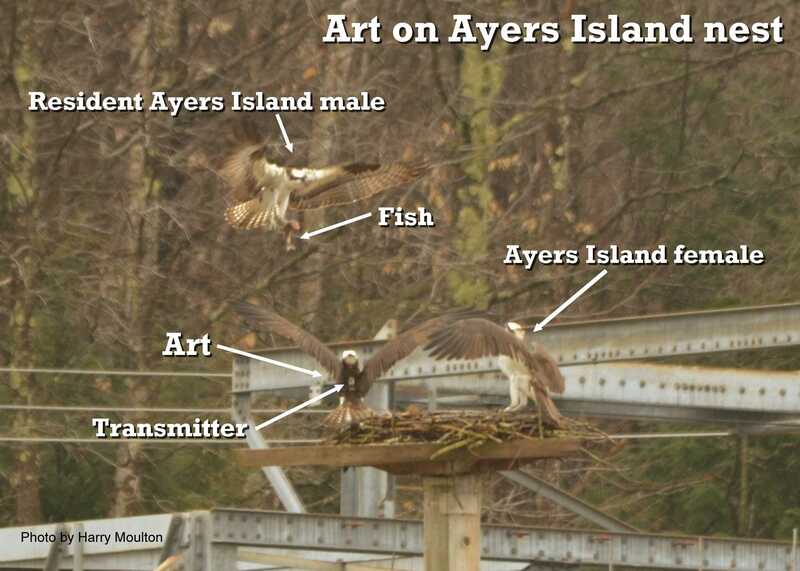 One of the regular watchers of the webcam at the Ayers Island Dam nest (about 8.5 miles to the south of Art’s nest) noticed a male Osprey on the nest at about 9:00 this morning. She snapped a still shot from the web feed and sent it to me. She was intrigued because the resident female was not greeting the male with the usual behavior and the male in the photo clearly had a leg band (the resident male at Ayers does not). As I looked at the photo I was sure I could make out the tell-tale shape of a transmitter on the back. Could it have been Art paying a visit? An hour later, I got confirmation. By chance a local photographer was taking pictures from across the river (at a public viewing site set up by PSNH at Ayers Island) and witnessed the whole thing. 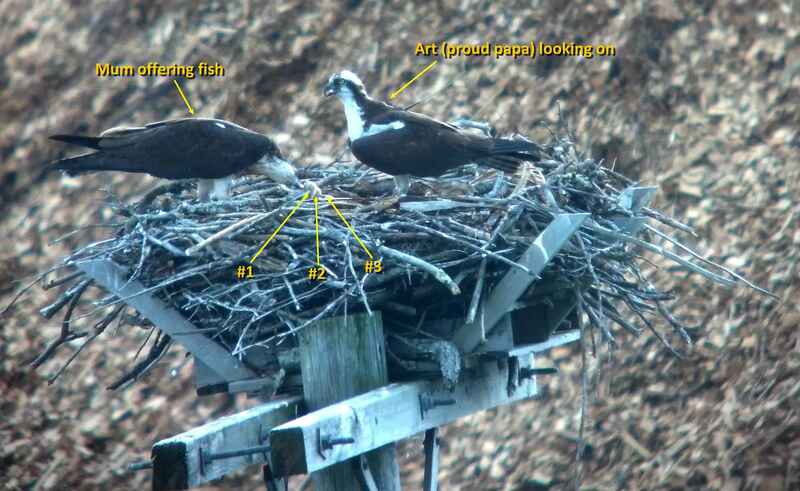 His photographs show two Ospreys on the nest (one with a transmitter) and a third with a fish (the resident male) overhead. Art was no doubt sent packing by the rightful owner of the nest . . . and half an hour later Art was skydancing over his nest. So was he “testing the waters” at a different nest? From a biological standpoint, keeping your options open is a good thing. Perhaps there might be an opportunity to mate with another female (passing on his genes is a driving force). Anyway . . . let’s keep this just between us . . . we don’t want his mate to know!! What a showman!! Art arrived back at his nest after his 5,000 journey at 9:53am this morning. I had stayed until last light yesterday evening on the hunch that he might have made it home then, but he did not. His mate was patiently waiting and added a couple sticks to the nest while I watched. This morning I was back at the site at 9:00am with a group of reporters and a film crew from WMUR. Art did not disappoint. As I hoped, he made a spectacular and triumphant return to his nest. I heard him before I saw his as he whistled his aerial display call, then he came into view from the south-west tumbling and swooping overhead in what is known as a “skydance” – making it clear to any other Ospreys that this is his territory. His mate had spotted him before we did and was in the air nearby. His final stoop was breathtaking and he landed on the nest that he had last visited in September. His mate flew immediately to the nest and perched beside him. Art immediately assumed a pose I have seen many times before; drooping his wings and turning his back to the female in a submissive posture to assure her that he is friendly and not a threat. After a few minutes together, he flew to a favorite perch across the river and preened. She flew to a perch nearby. After about 20 minutes, she called to him and he flew to her, landed on her back and they mated (no “dinner, flowers and a movie” in the Osprey world). He then perched next to her for a few minutes and then headed off to catch a fish while she pottered in the nest again; no doubt very pleased to have her mate back. Over the coming days, Art will get back to the routine of fish provider for both himself and his mate, and a clutch of eggs should follow in a couple weeks. It is amazing to see those dots of data on a map transform into a living bird once again. Art is home! 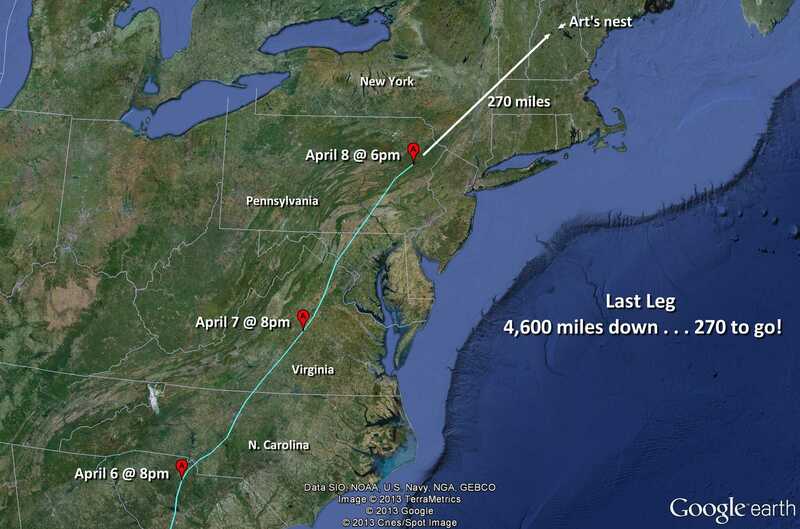 Art’s data continued to trickle in yesterday and the final data point at 6pm showed that he was blasting through Pennsylvania and almost in New York and just 270 miles from home. My guess is that he will make another big push today and be back at his nest this evening. I’ll be there to greet him. Home stretch! At 9am this morning Art was having breakfast on Lake Louisa in northern Virginia, just 513 miles from home. He could cover that ground in 2-3 days, so should be home sometime on Wednesday. He is following an inland route similar to his fall migration route and looks to zip up through western Maryland, Pennsylvania, New York, western Massachusetts and into New Hampshire. I won’t get another data download until Thursday morning – when he should be home . . . fingers crossed. His mate is pottering around the nest and bringing sticks, patiently awaiting Art’s welcome arrival. Art racked up another strong day of migration on April 2, traveling 219 miles, ending the day in Georgia, but since then he has slowed down and only traveled 80 miles or so over the next two days. I’m guessing he hit some rough weather. There is a big patch of rainy weather that is just exiting the Georgia coast, so perhaps he slowed down to pack on a few calories. As of this morning, he was fishing on a series of ponds and streams just west of Savannah, Georgia. The straight line distance from there to home is 975 miles. He could do that in 5 days if the weather cooperates. Meanwhile back in Bridgewater, Art’s mate arrived yesterday. I photographed her this morning (photo below) and saw her leg band confirming that it is his mate of the last several years. She was perched next to the nest preening and watching the southern sky. Art is keeping up his torrid pace. On the 30th, he did another 226 miles, finishing the day at a nice looking lake near the town of Las Cuevas. He spent a couple hours there on the morning of the 31st; no doubt catching and eating breakfast, and then was off again by 11am. He left Cuba at 2pm and started his ocean crossing to Florida, making landfall at around 7pm, having travelled another 260 miles. There is a gap in detailed data for most of April 1 (that will fill in later today) but his position at 9pm was another 227 miles further north (about 47 miles south-east of Orlando). If he keeps up this pace he could be home in a week! Other local Ospreys are arriving back at nests here in the Lakes Region. 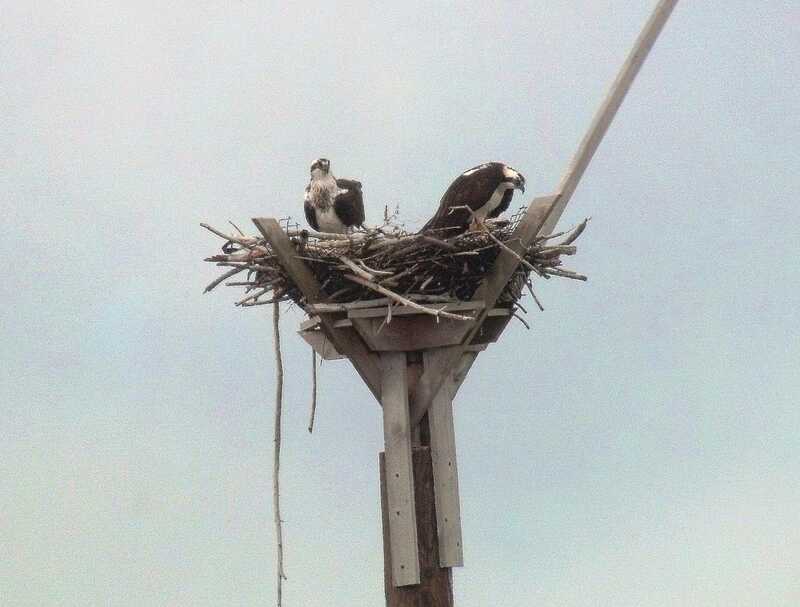 Jill and Chip's parents were both back at their nest in Tilton yesterday (see photo below). They immediately got down to the business at hand and were repairing the nest, mating, and generally getting reacquainted after their six months apart. It’s amazing how quickly an old pair reestablishes their pair bond each year. At their nearest neighboring nest in Belmont, the male had returned yesterday. I saw two other flyover Ospreys, continuing their journeys to nests further north. Art made a safe overnight crossing of the Caribbean Sea. He flew 452 miles in 19.5 hours and arrived on the coast of Haiti at about 11:30am (local time) on the 28th about 65 miles south-west of Port-au-Prince. He didn’t stop until he reached a lake named Etang de Miragoane where I suspect he picked up lunch. He moved west for a couple hours and then made a major course correction and headed north over the Canal du Sud, over the island of Ile de la Gonave and back to the mainland of Haiti about 60 miles north-west of Port-au-Prince, where he spent the night. On the 29th he made a 193 mile water crossing over to Cuba and ended the day near Palma Soriano about 90 miles west of Guantanamo Bay. His location points in the evening and the next morning were all close to a nice looking river on the edge of town so I suspect dinner and breakfast were available. The straight line distance from here to his starting point on the Tocantins is 2,555 miles. The straight line distance from here to his nest in Bridgewater is 1,641 miles, so he is well past the halfway point. There is still so much ice on the ponds and lakes here, but maybe by April 10 his favorite trout snack bar at Sky Pond will be open for business. On the 30th he had a little bit of a lie in (it is Saturday) but was off by 10:30am and making good time. By 3pm he was another 123 miles closer to home with another 3-4 hours of daylight left. Since leaving his winter home on March 15, he has flown a little over 3,000 miles. Because of the holiday weekend, we won’t be able to update Art’s blog until Tuesday. Just in case you are chomping at the bit for news of his Caribbean crossing, I’m sure he did fine. One of the inexperienced juvenile birds (Snowy) made the crossing easily on the same day, so I am confident that the veteran Art is now well on his way through Cuba. The Estonia Ospreys are not back yet and the camera is not live, but they also have a fantastic White-tailed Sea Eagle cam, a Wild Boar cam, a Tawny Owl cam and they just launched a Brown Bear Cam. Their Osprey Cam should go live in a couple weeks – it’s worth the wait. I got another installment of Art’s data late yesterday which revealed that he continues to not mess about. He decided to embark on an overnight crossing of the Caribbean. 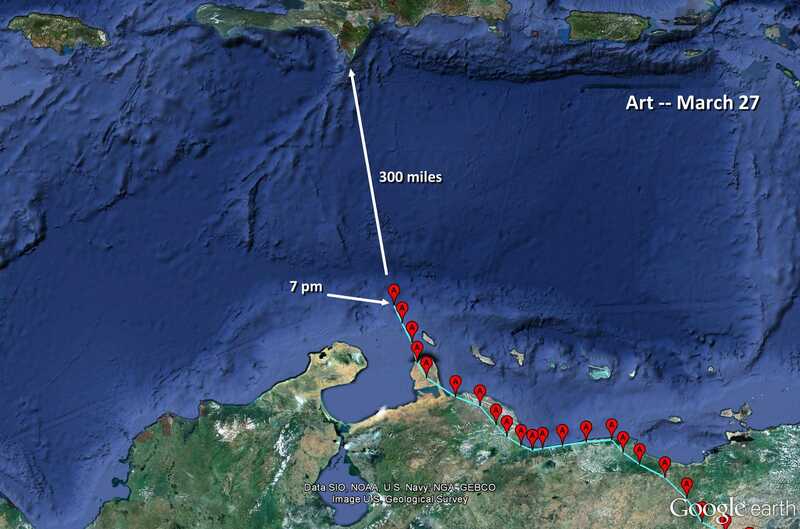 He departed the tip of Paraguaná Peninsula a little after 4pm (local time) and by 7 pm was 75 miles into his journey, with another 300 miles of open water to reach Haiti or the D.R. The weather over the Caribbean is clear with minimal winds so it should be clear sailing for Art. In fact, as I write this (at 9:30am on 28th), he should already be back over dry land. Art has made fantastic progress in the last couple of days. After spending the night of the 24th in Guyana, he crossed into Venezuela on the 25th and logged 285 miles that day. On the 26th he traveled 360 miles and hit the coast of Venezuela to the east of Caracas. He cruises along the north edge of the El Avila National Park (an impressive mountain range that stretches right along the coast) and ended that day near Puerto Cabello. He was off again earlier today and by 11 am he had met up with his fall flight line and was heading towards Paraguaná Peninsula. Looks like he will make his return journey over to the Dominican Republic in the next 24 hours. He is a bird on a mission! Since he kicked into real migration mode on March 20, he has covered 1,570 miles – an average of 220 miles/day. Art is making excellent progress and really put on the after-burners over the last few days. Once he crossed the Amazon Basin (see second map below) he really made a push; covering 218 miles on the 20th, 214 miles on the 21st, and 170 miles on the 22nd. By the end of the day of the 22nd he was perched along a remote river in Suriname. He got a later start on the 23rd as he fished along the river but later in the day crossed into Guyana and spent the night there. He was off bright and early on the 24th and by 1pm was again in high gear and over 3,000 feet up cruising over more hilly terrain. Ahead is more mountainous country including the spectacular Mount Roraima at over 9,000 feet elevation. Art looks to skirt the mountains and cross into Venezuela in the next 24 hours. The second map below is one that Rob sent me of an older false color satellite image. He used it on his website to point out some amazing facts about the Amazon Basin. “After Art left the Tocantins, he crossed over Marajo Island, which at 15,500 square miles is roughly the size of Switzerland and forms a big part of the Amazon delta. The main branch of the river passes north of the island. The Amazon drains an area roughly equal to the size of the lower 48 states. 20% of the world’s moving fresh water passes through the delta.” Art is in some big country. After loitering along the Tocantins River, Art struck out finally on a north-westerly course and made good progress over the last couple days. He is now over 500 miles from his winter home, but still a long way to go. 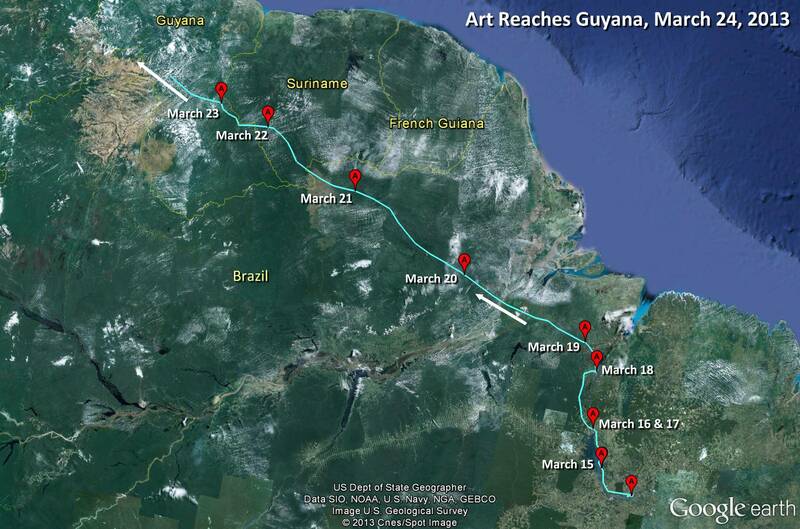 He is taking a more easterly route than in the fall and looks like he is going to track through Suriname and Guyana. Bridger, Rammie, Senior Bones, and North Fork Bob (all adult males) are also on the move. You can follow their progress from the links on the “maps” page. Art is not exactly burning up the miles so far. He’s easing into this migration! After starting on March 15, he spent the first night less than 80 miles from his winter home on an island on the east side of the huge flooded section of the Tocantins River. He liked it there so much (or maybe the weather wasn’t conducive to flying) that he spent the whole of the 16th there, fishing amongst the many islands. He spent a second night there and then headed off at 9am on the 17th. He only did another 70 miles on the 17th, ending his day at 4pm. The map below shows his spring route (in blue) compared to his fall southbound route (in yellow). Art began his northbound migration this morning at about 11 am (local time). He’s got a long journey ahead of him. He started the trip following the Rio Tocantins west and then north. It will be interesting to see how his route north varies from his southbound route. I’ll give updates every three days or so. I suspect Art is getting “itchy wings” and may start his long journey north in the next 10 days or so. He is typically back at his nest in Bridgewater by the first week of April. It took him 35 days to make his journey south, so I suspect it will take him about the same amount of time to return. He has continued to make daily flights from his main lake and roost sites to the un-named lake to the north. Overall, he has been moving around more on a daily basis for the last couple weeks – maybe limbering up after his several months of kicking back. This latest map shows his flight lines since he settled here on December 4. He has a couple of regular roost sites that he uses every night and then spends most of each day perched next to an area of water – always on the lookout for the next fish dinner. He has plenty of choices on the Rio Tocantins. I recently came across a paper on the fish species found in the Tocantins watershed. The researchers documented 343 species of fish -- there are a total of 48 freshwater fish species in New Hampshire, so Art has a little more variety in his diet down there. I decided it was time to give a quick update on Art. Dull news is good news. Art is doing just fine feeding along the four-mile long “lake” to the north of the Rio Tocantins. In the last couple week he has been exploring along a river and additional lakes slightly to the north of his prime location, but basically he is just hunkered down. He should be starting his northward migration in about a month. Discuss how the work can be extended to other species of birds, mammals and reptiles. My presentation focused on our Osprey education program and our experiences with using Ospreys as a teaching tool. Great stuff! 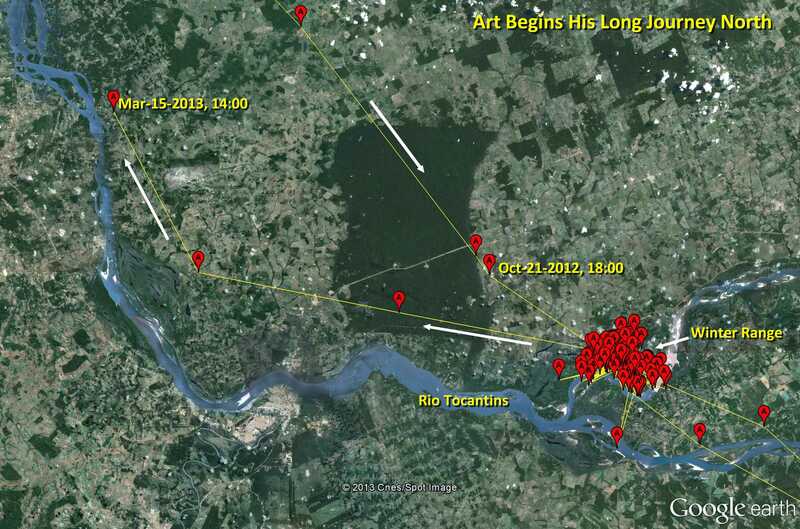 Art hasn’t moved outside a 4.3 square mile area just north of the Tocantins River since he relocated here on December 4. He roosts in two spots along the north shore of a long narrow lake (that is probably a now-isolated flooded oxbow of the river). He has taken a couple trips over to the main channel of the river, but they are short-duration trips. The fishing seems to me much more favorable on the “lake.” As winter starts to slowly take a grip on Art’s summer home in the New Hampshire Lakes Region, I can see why Art leaves here. Although Little Squam and the rivers are still open, Sky Pond, Winona Lake and many other smaller ponds that Art fishes on in the summer are freezing over. His nest in Bridgewater looks uninviting when covered in slushy snow! The nearest weather station to Art (about 30 miles away in Maraba, Brazil) shows a day-time temperature of 91 degrees today, with 73 at night. The photo below is posted on Google Earth and was taken in Sept, 2007. It shows the confluence of the Rio Tocantins and Rio Araguaia just six miles from Art’s roost sites. His “lake” is just visible beyond the distant river bend. Art moved! 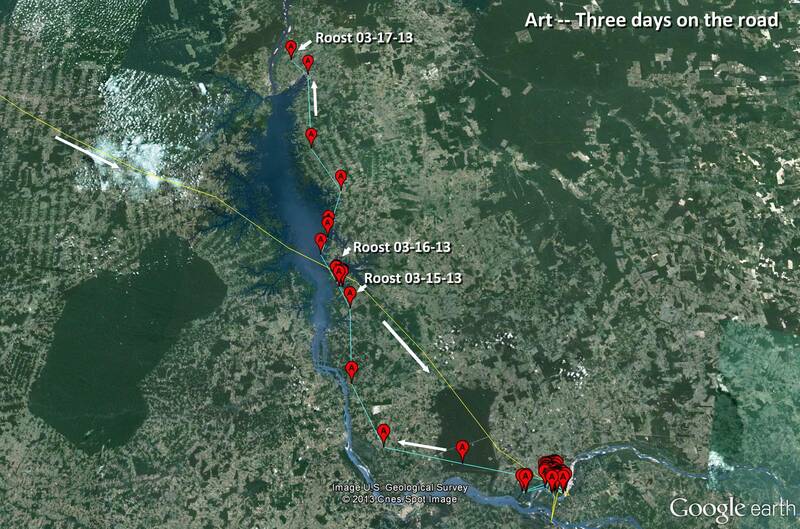 After six weeks of barely moving from the Rio Araguaia, Art made a 30 mile flight back to an area of the Rio Tocantins where he visited from October 21 to 25. For the last three days he has been on a small oxbow/lake near the river. Perhaps conditions on the Rio Araguaia changed – maybe heavy rain causing increased turbidity – who knows, but he went on a road trip and has settled for now on the Tocantins. All is well with Art. Same routine each day in exact same location. Below is a map showing the locations of all the tracked Ospreys. In addition to Art, Belle is back at her previous winter location in Brazil. Bridger is in Bolivia. Senior Bones is in his regular winter haunt in the highlands of Colombia and Snowy and North Fork Bob are in Venezuela. Bob is hanging out in a new location and has not returned to the area where he spent his previous two years (yet). After lingering for a long time in the Dominican Republic, he finally crossed to Venezuela, but seems to be in no hurry to return to “home.” His current location had us concerned for a little while because the Google Earth maps show a very dry landscape with no water anywhere in sight, but Rob deduces that right now this area must be flooded and Bob has found a rich temporary “lake” full of fish. He headed south again on the 21st in the direction of his winter home 240 miles away, but turned around after 50 miles and went back to the flood. It’ll be interesting to see how long he stays here. Art is exhibiting typical “I’m on vacation” Osprey behavior. Since he arrived at his winter home on October 25, he has not moved outside a six square mile area. His day basically consists of: wake up, catch fish in river, eat fish next to river, perch in the sun, catch fish in river, eat fish next to river, go to roost and sleep . . . then wake up . . . and repeat until March. I think he deserves a little R&R. When he left Brazil last March he flew 5,000 miles back to his nest in Bridgewater, New Hampshire, reunited with his mate of several years (after a week-long tryst with another female, while waiting for her delayed return), refurbished his nest, defended it from all-comers, helping to incubate three eggs for 40 days and providing fish for his mate every day from April to August and raised a big healthy chick. We tagged Art on May 29th and from that date until his departure south on September 11, his transmitter logged nearly 1,500 miles of foraging within a 374 square mile range. Then he flew another 5,000 miles back to the Rio Araguaia. That’s a lot of miles. 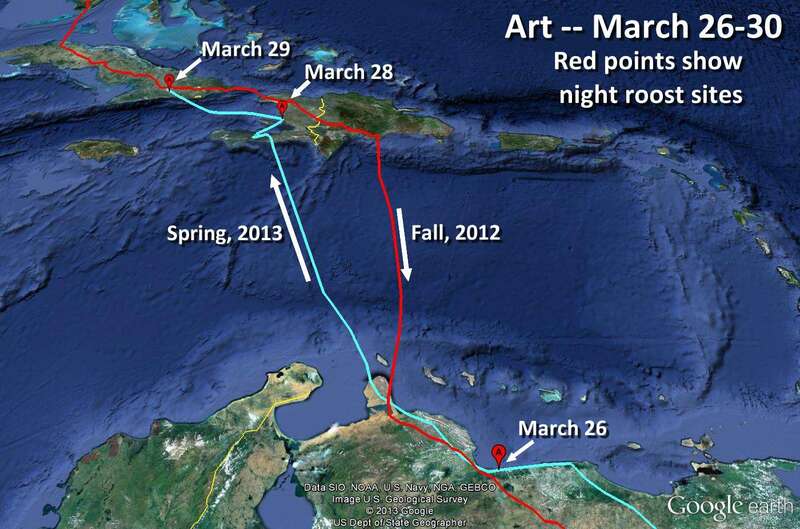 Here is a summary of Art’s journey home since he arrived in Venezuela on October 5. Art has settled in and is hunting and roosting in a very small area along the Rio Araguaia. Since his arrived here on October 25 he fishes off the sandy point of an island and perches along the edge of the river. He has used two roost sites in an area along the south shore of the river. The resolution on the maps here is not great, but the 2010 image looks like the area was cleared (logged) so I assume that Art is roosting in snags left after the clearing. He looks very settled after his 5,000 mile journey. He may stay in this very small area of the river for the next 6 months. 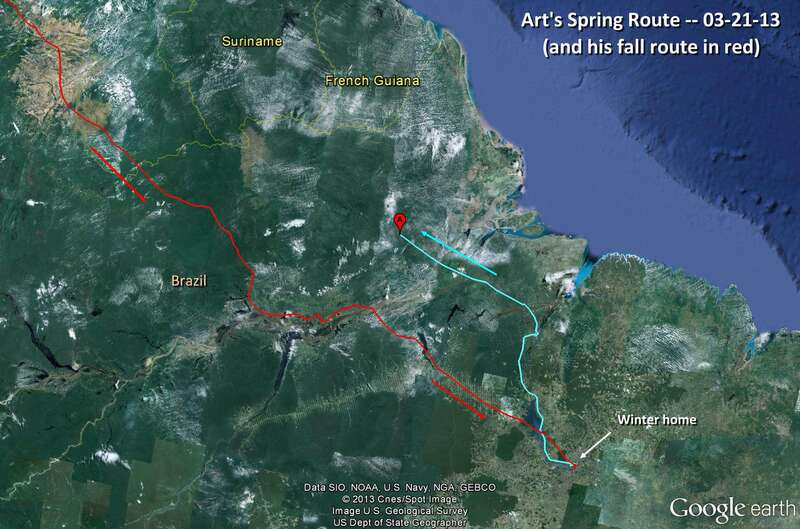 Rob has never had one of his tagged birds visit this part of Brazil, so Art is breaking new ground for the study. There is some interesting news about some of Rob Bierregaard’s other birds. Bridger an adult male from Long Island is in Bolivia! Rob has never had one of his birds reach Bolivia before. Belle (an adult female from Martha’s Vineyard) is home deep in south-central Brazil along the Rio Madeira, but North Fork Bob (an adult male from Long Island on his way back to his winter home in southern Venezuela) is stalled in the Dominican Republic -- which is usually not good -- and Thatch has been stalled on Curacao since October 10! (1,100 miles from his winter home on the Amazon). You can follow all the birds from the maps page. Now that Art is settled in, his movements will likely be minimal and my updates will be less frequent, unless something noteworthy happens. I’ll try to post once a week, but assume that no news is good news. Art is safely back to his winter home. He spent 3 days on the Tocantins River, but on the 25th moved 27 miles to fish along the Araguaia River which merges with the Tocantins. My guess is that the water levels in the river right now are lower than the 2010 Google Earth images, as there are several points where it looks like Art is perched IN the river, but is certainly perched on exposed sand banks. Both rivers have many exposed sand banks and the images available on Google show a lovely area. One photo shows Roseate Spoonbills and Black Skimmers perched on such a sandbank, so Art is sharing the river with many other birds. There are several towns nearby and it looks like there is a thriving tourist industry along the river. Now that we have lost Jill and Chip, all our attention goes to Art. He continues to head for his winter vacation spot with determination. Since leaving NH on September 11, he has travelled about 4,900 miles in the six weeks since he left. He has now left the main trunk of the Amazon far behind and ended the 22nd and started the 23rd on the Tocantins River in the Maranhao region of Brazil. The area close the main channel of the river is filled with ponds that are obviously now-isolated oxbows and channels of the river -- lots of great choices for fishing. I’ve said it a couple times now . . . is this where he hangs his hat for the winter? We’ll soon know. Over his six weeks of travel any stop overs that he has made have been short (no more than 2 days) so if he is in the same spot when we get the next download in three days, we ‘ll know that more than likely his journey is at an end. Rob and I were ready to put money on Art stopping at the location he reached on the 16th, but . . . he’s not home yet. He has travelled another 265 miles further east. He followed the major corridor of the Amazon (which is more than 20 miles wide her!) He crossed the river at a narrower point and has moved south-east to a large body of water that stretches north to south from the main Amazon. He camped out here on the night of the 19th and was on the move again at 8 am on the 20th. That body of water looks like a “river” but is 8 miles wide; more like a lake, and is linked to the Para River which is part of the Greater Amazon River system. The vastness of the landscape is hard to grasp in Brazil. As expected Art crossed the Equator a little before 3 pm on the 15th. He continued south-east deeper into Brazil. On the 16th he only travelled 75 miles to a vast area of wetlands surrounding the Troubetas River just 27 miles from the main trunk of the Amazon. Is this his winter home? It certainly looks like a wonderful spot . . . 3,257 miles (direct line) from his nest in Bridgewater, NH. His travel path since leaving Sky Pond in New Hampton at 10 am on September 11 has taken him 4,391 miles. Art is still on a direct course to his winter home. He is showing the typical “I know where I’m going” behavior of an adult bird returning to familiar territory. His route has been remarkable direct since he hit the coast of Venezuela on October 5. He left Venezuela (after a quick stop right next to spectacular Angel Falls) and headed into Brazil, then crossed into Guyana and then back into Brazil. He has probably crossed the Equator since the last upload and was just 300 miles from the main branch of the Amazon. If I project his heading forward, he will intersect the Amazon at Santarem in the Para Region of Brazil where the Tapajos River meets the Amazon – a vast area of wetlands that looks like Osprey heaven. He has travelled more than 4,000 miles since he left New Hampshire on September 11. Art I think is close to his winter home in Venezuela. On October 8, he was on his way by 9 am cruising high and fast SE covering 150 miles by the end of day. He stopped for a fish on a small river near Matapalar. On the 9th he skipped a short distance over the Caura River (a tributary of the mighty Orinoco) and roosted close to the Caura Lodge (an ecotourism site in the middle of a 12.36 million acre forest reserve). On the 10th he moved just another 50 miles or so east to a remote area of marshes and winding river oxbows. Looks like a nice place to spend the winter – just like the Pemi or Baker Rivers, but maybe a little warmer. Art is making his way at a leisurely past east through Venezuela. After arriving on the Venezuela coast late on October 4, Art was on the move by 9 am on the 5th. He stopped off for breakfast on the edge of a coastal bay near Coro then by noon was moving fast and at high altitude SW. He stopped off to fish again along a river near Araurima Abajo and spend the night there. On the 6th he was moving by 9 am and skirted along the coast and then over to a large inland lake called Lake Valencia which looks like a lovely place for Ospreys. He spend the late afternoon and night here. At 10 am on the 7th he was fishing over the south shore, then was on his way again by noon. He continued easterly and ended the day about 60 miles south of Caracas about 250 miles from his arrival point in Venezuela. Art made his crossing of the Caribbean yesterday. He showed the experience of a veteran by making a perfect daytime crossing. By 9 am yesterday he was 60 miles into his journey from The Dominican Republic and at 9 pm was within 70 miles of the Venezuelan coast. That was the last GPS location in this download but there were several of the less accurate, non-GPS Argos Sat. points that show he was on dry land on the north coast of Venezuela at 7 am this morning. Now where will he head? Art is in Haiti. Art crossed over to Haiti on October 1 and ended the day in the region known as Nord in northern Haiti. He took his time working through Cuba, stopping off to fish every day. He should be making his ocean crossing to South America in the few days. Art is still in Cuba. It looks like there was some stormy weather moving through the country, so he is taking his time. He is taking a more inland route than Jill. Between the 26th and 28th he moved 186 miles south-east and ended the 28th roosting on the edge of some woods in some heavily cultivated lands a few miles north of Contramaestre. So far he has covered a little over 2,100 miles. On the morning of the 29th he was fishing along a nearby river – Art is never one to pass up a good fishing opportunity. 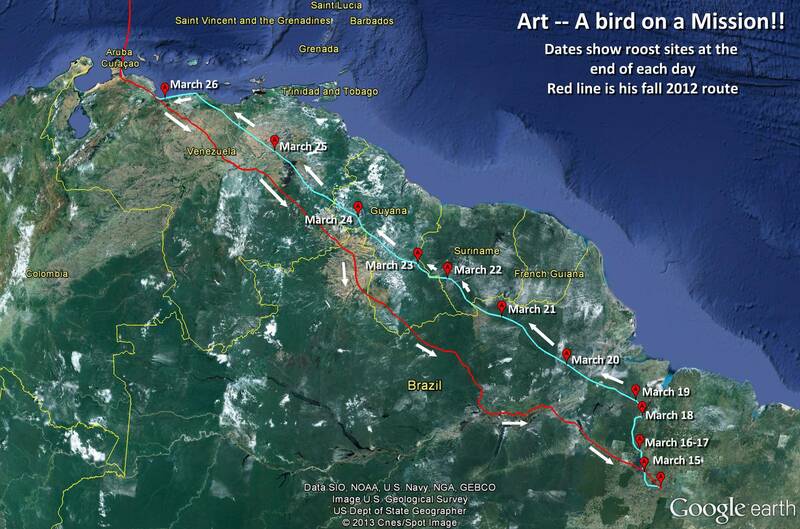 Art’s route and roost sites in Cuba. He left the southern tip of Florida on the 24th at 11 am and arrived in Cuba at about 4:30 pm. He roosted a few miles inland and was on his way again by 10 am yesterday. It looks like he stopped for brunch at a lake called Embalse Alacranes near Rodrigo and ended the day near La Teresa. Art is now following a similar path as Jill through Florida (see map). He ended the 20th and began the 21st fishing along the Altamaha River north of Jesup, GA. By 3 pm on the 21st he was over the border in Florida (just west of Jacksonville) and ended the day near a small pond called Silver Lake near the town of Fort McCoy in Marion County. He was perched next to Silver Lake for at least an hour in the morning of the 22nd (breakfast) and then was off again with a good tail wind. He ended Saturday near Sebring in Highlands County. He’s now about 1,400 miles from his nest. We’re getting patchy data from this transmitter right now (which is a little vexing), but Art is now in Georgia. He spent a couple days resting in southern Virginia and then pushed on through North Carolina on the 19th ending the day along the Wateree River near Oakland, SC. He pushed south again on Thursday (20th) and by 3 pm was moving fast (32kph) and high over the Savannah River right on the border between S. Carolina and Georgia. He still had at least three hours of flying time and was literally yards from the border, so it’s safe to say he ended the 20th on the coast of Georgia. Art ended 9-14 on a small stream in Hampton County, W. Virginia. On the 15th he made excellent southward progress (191 miles) cruising through Virginia and ending the day in an area of ponds and oxbows along the Dan River west of Danville, Virginia. He took a break and hung out here for the next two days fishing on various ponds and along the river. Art started on his journey on September 11. At 10 am was enjoying a breakfast of trout at Sky Pond, but by 11 am he was 500m up over Franklin Dam, cruising at 35 kph and by noon he was right over Henniker 720m up and cruising SW – Art’s migration had begun. There was a gap in his data points, but by 4 pm he was well through western Massachusetts. He stopped off for supper at a little pond called Long Pond near East Otis, MA, where he spent the night (125 miles from home). At 9 am on the 12th he was still on that pond, but by 10 am he was fishing on Doolittle Lake near North Canaan, CT. He cruised through New York State and ended the day on the Pocono River, in PA. On the 13th he followed the ridges of the Appalachian Mountains through PA. He crossed the Susquehanna River at 5 pm near Dundore and roosted on a ridge top north of Mifflintown, then on the morning of the 14th, he started the day cruising over the Juniata River continuing SW, exactly 400 miles from his nest. On September 10, I went to look for Art at his favorite ponds. I quickly found him at 1 pm at Jackson Pond. He was perched with a fresh-caught trout. He was in no hurry to eat it, but after a while, he tucked in and ate the whole thing in about 45 minutes. Just before 3 p.m. he took off and circled for a while a then headed over towards Sky Pond. It took me less than ten minutes to reach Sky Pond and got there just in time to see him lifting off the surface with another trout. He circled the pond and headed back over towards Jackson Pond. What a great location to fatten up before a 3,000+ mile journey. He'll be in great shape for the migration ahead. Art’s behavior has changed suddenly. For the last five days, Art has been spending all his time on Sky Pond and Jackson Pond. His last point at or near his nest was 3 p.m. on 31st (Friday). He roosted that night at his favorite roosting spot on the river 3.5 miles south of the nest. He spent the whole of the 1st on Sky and Jackson, then went to roost at his usual river spot at 8 pm. By 9 am on 2nd he was back over between Winona Lake and Lake Waukewan and then spent most of the day again on Sky and Jackson. Same pattern on September 2nd and 3rd. By 9 am on 4th he was back on Sky Pond and spent all day there and roosted there that night. All of his location points on the 5th are on Sky Pond (through 3 pm). I suspect his daughter has departed. He had no takers for his fish on Friday afternoon and since then he is foot loose and fancy free fattening up on trout prior to his departure. A smart veteran. Not much change for Art this week. He is still foraging close to the nest; likely still providing food for his daughter. The map shows his “territory” in relation to Jill’s nest. No change for Art. He is still on his home territory. He is fishing on Little Squam pretty much every day. One interesting new observation is that he has been roosting each night (at least since the 14th) along the river 3.5 miles south of the nest. The transmitter has recently changed to transmitting locations each hour from 9 a.m. to 9 p.m. (rather than 6 a.m. to 6 p.m.). Every 9 p.m. point since that change has been at the same location. I wonder whether he roosted there earlier in the season and the timing of the data uploads just didn't reveal that. Art is working his usual haunts. Favorite spots right now are along the Pemi and on Little Squam. He did visit one place that he has not been all summer – Stinson Lake in north Rumney. Doesn’t look like he had any luck there, as he continued on back to the main channel of the Pemi. Art’s chick fledged a couple weeks ago. Art continues to provide food for the chick (and his mate) at the nest. The chick (which is a female) will now be following Art around and starting to fish for itself. His mate will likely depart on her journey south any day. Art will stick around with the chick until early September. Here is a map of all of Art’s point to point paths to and from his favorite fishing holes and back to his nest since we tagged him on May 29. This map shows all his activity from May 29 to July 17. He is spending more time fishing on the Pemigewasett River. Water levels have dropped and likely the river is less turbid and fishing is easier. He has also been spending more time fishing on Little Squam Lake. So far he has not ventured over to Big Squam. Best guess is that the pair of Bald Eagles that nest on that lake make fishing there a gauntlet, so best to stay clear. Interesting that he made one very brief visit to Newfound Lake. Eagles also summer over there and perhaps he though discretion was the better part of valor. Cocktail Hour on Little Squam. During the week of July 8, he visited Little Squam four times – all at 5 p.m. – they are creatures of habit! Water levels have dropped recently and fishing must be more attractive. Once again his trips were quick and he was back to the nest by the following hour. His single chick is looking very healthy, fully feathered and within a couple weeks of fledging. This map shows all of Art’s travels from May 29 to June 23. Most of the Baker River visits are first thing in the morning – he clearly has his favorite spots. Sky Pond (a well know trout pond) is an almost daily hunting spot. Based on the data, he seems to be finding fish easily. His foraging trips are quick and he is back at the nest (presumably with a fish) within an hour. It’s interesting, that so far he has not overflown the airspace of his nearest neighbors (8.5 and 9.5 miles away). 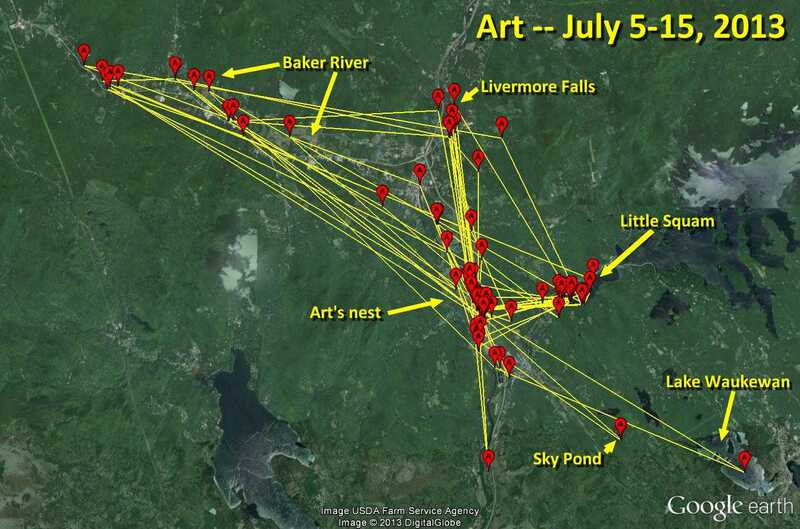 This map shows Art’s foraging in the first few days after tagging. He visited the Baker River in the early morning and also visited Winona Lake and Sky Pond in New Hampton. Up to 8 miles from nest. Art was trapped at his nest using a noose trap on May 29. He first built this nest on a disused utility pole late in 2007. He raised single chicks in 2008 and 2009, and two chicks in 2010. In 2011 we attempted to catch him in May, but he was having none of it. We did trap his mate (and band her). Their nest was destroyed in a freak windstorm in June just after they hatched one chick. A new platform and nest was installed (bolted firmly to the cross arms of the pole) in June 2011. Both adults returned in 2012 and happily accepted their new nest. We successfully trapped him (with a newly designed nest trap). They were incubating 3 eggs. Signs of hatch were see by June 2.